NETWORK FINALS: CBS’s NCAA TOURNAMENT telecast adjusted to 4.0. 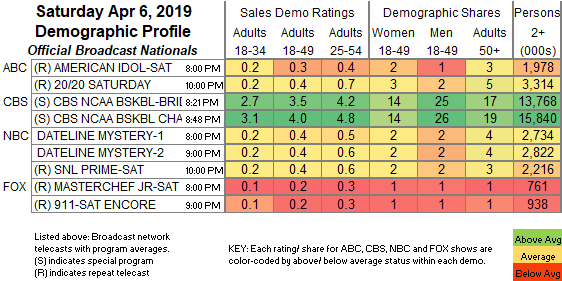 In addition, the 9PM hour of DATELINE lost 0.1 in final numbers. CABLE HIGHLIGHTS: A&E’s LIVE PD led the day, up a tick to 0.63. Adult Swim’s line-up performed as follows: DRAGON BALL at 0.39 and at 0.11/322 & 0.14/343K compared to last week’s 0.33 and 0.10/232K & 0.14/340K, BORUTO up 0.06 to 0.30, MY HERO ACADEMIA up 0.01 to 0.24/523K, SWORD ART ONLINE at 0.19/0.20 compared to last week’s 0.18/0.18, JOJO’S BIZARRE ADVENTURE up 0.02 to 0.18, BLACK CLOVER up 0.02 to 0.17/346K, HUNTER X HUNTER up 0.01 to 0.15/300K, NARUTO up 0.02 to 0.14/319K, and ATTACK ON TITAN down 0.01 to 0.11/232K. Hallmark’s movie TRUE LOVE BLOOMS was at 0.22. 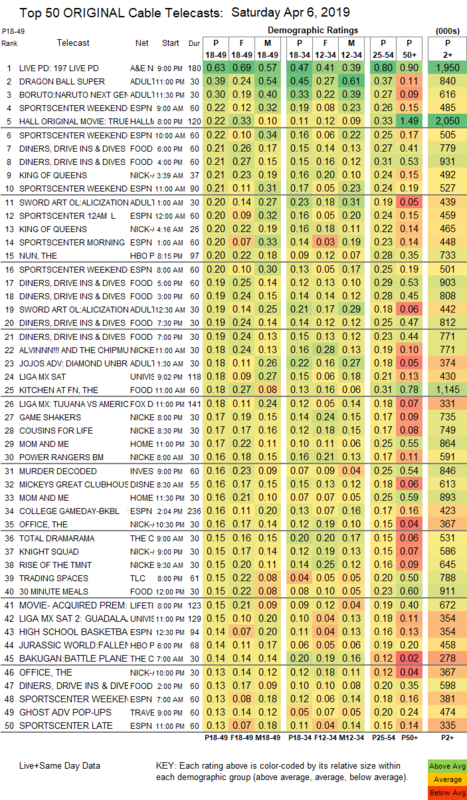 On Food Network, KITCHEN AT FN lost 0.03 to 0.18, and 30-MINUTE MEALS was at 0.15. On ID, MURDER DECODED was at 0.16. On TLC, TRADING SPACES dropped 0.05 to 0.15, and WHILE YOU WERE OUT shed 0.03 to 0.12. On OWN, BOOK OF JOHN GRAY was at 0.08, and FAMILY OR FIANCE was at 0.08 compared to last week’s 0.08/0.08. HBO’s original movie NATIVE SON was at 0.07. Syfy’s ALIEN NEWS DESK fell 0.05 to 0.04. My Little Pony two part premiere at 11:30 and 12pm on Discovery Family? Thanks. Do you have Beyblade Burst at 8 AM on Disney XD? Sorry, we have no listing for that show on Saturday. My Little Pony: Friendship is Magic at 11:30AM and 12PM on Discovery Family.